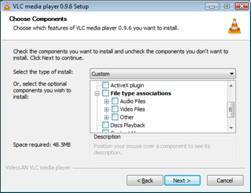 VLC media player is a replacement player for music and video files. When you install VLC, the installer will also install a number of codecs that may be useful for playing some sorts of media files (e.g. the Seashell grid set). Although VLC installs the codecs, they can also be used by Windows Media Player. 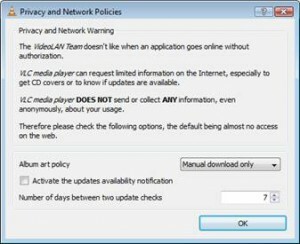 These notes show you how to install VLC so that you can use the codecs, but continue to use Windows media player as your default media player. Download VLC media player, save it to your desktop and start the installation program running. IMPORTANT: On the ‘Chose Components Screen’, clear the check box for all components except ‘Media player (required)’. If you start VLC you may see a screen about automatic updates. Clear the checkbox to avoid annoying messages. For more details on VLC media player see this link.